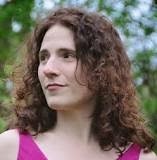 I first met Anne Ursu through Readerville, the online writing community, and like most of her friends, adored her instantly. We email occasionally, I've played her tapes of my son singing when he was two, and I follow her life on Facebook as religiously as I read her amazing books. 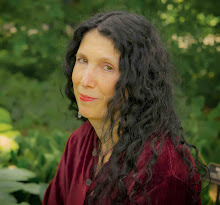 She began her career writing for adults, with Spilling Clarence, a novel I happily blurbed, following it with The Disapparition of James, and then moved on to writing for kids. And what she writes is stunning. The Cronus Chronicles dipped into Greek mythology. 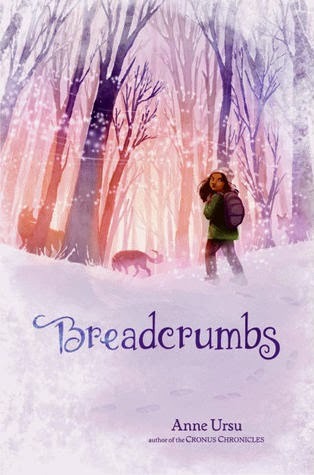 Breadcrumbs, a haunting retelling of The Snow Queen, received starred reviews from Booklist, Publisher's Weekly, School Library Journal and more, and it was a selection for NPR's Backseat Book Club, and well as a Junior Library Guild Selection. 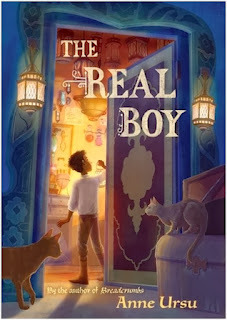 Her latest novel, The Real Boy, about how we find our place in the world, is on the long list for the 2013 National Book Award. I'm so honored to host Anne here! I had such a profound relationship with books when I was a kid. My mom said I used to disappear into my room on Friday night with a stack of library books and come out Monday morning with them all read. When you're a kid, you absorb books in a way adults just don't, you really absorb them into part of your own being the way you do with important experiences. And so I've carried all those books I absorbed with me, and the thought of kids books always made me really happy. As I was working on my adult books, I became good friends with someone who was writing middle grade fiction. And I thought, "Wow, you can DO that?" I got a little discouraged with adult fiction and all the rules surrounding it. It seemed like women writers especially were expected to write very straightforward books and if you tried to play around with form or ideas there was something suspect about the work, and then no one really listened. My second book involved a family who took their little boy to a circus and a clown accidentally made him disappear; the book then follows the family. 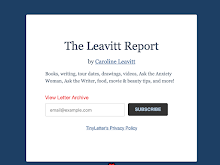 I was trying to write about the absurdity of loss, and it seemed like using that heightened situation was the most resonant way of getting at it. After the book came out, I was at an author festival sitting at a table while people examine your books and smile wanly at you, and this woman came up to me and asked what the book was about. I told her, and her nostril visibly twitched. "Oh," she said, "I don't like that magic stuff." And I think that was my problem: I loved that magic stuff. To me stories were all about magic of one kind or another. And meanwhile I was reading my writer friend's brilliantly imaginative very smart stuff, and then I picked up Harry Potter, and then it was all over. I fell in love with fantasy for young readers--it was so smart and inventive and playful, and meanwhile these books were engaging with really fundamental ideas about the human experience. The great thing about middle grade is it's just you and the reader. No one else is paying attention. And these readers are so open-minded and open-hearted; they don't have preconceived ideas of what stories should do or how they should work. So you have that much more freedom. I was deeply moved by an essay you wrote about how you wrote The Real Boy for your son Dash, who has Asperger’s. You wrote that you wanted him to have a book where a boy like him is the hero, which is really what everyone wants out of the books he or she reads--to find someone to connect with. How difficult was it to write such a book? Did anything about the writing surprise you? I'd been thinking for a while about trying to write a fantasy that got at the experience of having Asperger's in some way. My son's experience of the world is completely strange to me; I can't comprehend what it is like to be him. Really, I had all these elaborate ideas about making the experience of the fantasy world feel like having Asperger's, but in the end it became writing about this boy who doesn't feel like he's made the same way as everyone else. And while he is a child that would be diagnosed as on the spectrum today, I think everyone can relate to that feeling. I was very scared about the idea of trying to write an Asperger's character. I didn't want to get it wrong. And there are so many stereotypes out there--I think a lot of popular depictions of autism are more stereotype than character. People with autism can be very empathetic, very sensitive, very imaginative, but you would never know it by the way they are portrayed. As I was writing, though, all that seemed to matter was Oscar; he was who he was. You can't worry and write; you just have to let your characters be who they are going to be. What struck me when I read the book was the extraordinary way you don’t talk down to kids, you respect them, and your admiration and support and being-in-the-trenches-with-them feeling comes out on every page. You talk about very adult issues, what does power mean and when does it corrupt? What does it mean to be brave and what is the cost? I also deeply admired the ending, which I won’t give away, how it doesn’t necessarily give the characters what they want, but it does give them what they need, and it’s open-ended in a very adult way. Did you always know this ending? I tend to fly pretty blind when writing--I start with the characters and a few loose ideas and see what happens. Generally, the story reveals itself--narrative has it's own imperatives--and once I got going it seemed clear what would have to happen: The world had become corrupt, and no one was going to be able to step outside the system and see what needed to happen except for the children. As adults we sometimes have this idea that stories for kids are supposed to end prettily, happily ever after. But I think the real job of middle grade isn't to tell kids that the world is all okay, but that they are okay, that they have the ability and power to change things for the better. I also was done in by the way you connected the larger world with Oscar’s very intimate story. How did you build those connections? I love writing fantasy because you get to take someone's internal life and build this entire world around it, taking the internal and manifesting it externally. Oscar thinks he's very safe in his small life, and so of course the book has to pull him out of the cellar and throw him into the big world. I tried to reflect his issues in those of the world at large--so as he struggles with his own imperfection, the adults are striving for perfection, and the events of the book come to question both of these concepts. And everything that Oscar faces has to challenge him specifically, his specific monsters need to come to literal life. And by facing them, that's how he grows and changes so he can be okay. Let’s talk about craft. How do you write? You’re an incredibly busy single mom and you teach at Hamline, so how do you manage? Do you have rituals? Bounce pages off writing partners? Do you outline or hope the muse is hanging around? This is a question I’m still trying to figure out; I don’t feel like I’m managing yet. The Real Boy is the only thing I’ve written in the last three years. When I was working on it I learned how to create time to write (mostly at night), but I’ve spent most of the last three years not writing. The real problem for me is accessing that creative space in my brain, the one that takes flickers of thoughts and spins them into a story idea. My brain is so filled with other things--I just don't think my mind has room. I've tried to build in more structure, but it just doesn't work; it's not realistic. I just saw the author Rainbow Rowell speak, and she said, "Your kids' entire job is to keep you from writing." Mine's really good at his job. I'm really interested in the way fantastic elements affect a story for the reader, how you can create meaning through the use of magic and the surreal. I'm trying to put together a lecture about it. I think I have two missions in life--to convince people that fantasy is a valid form of literary fiction, and to run around yelling AND ALSO THERE'S MIDDLE GRADE.